I'll start off by saying that this project was one big experiment for me since I've never painted a large vehicle before. I also have no airbrush so my options were limited. Thanks to Ron and his post on painting vehicles without an airbrush, I had some idea what to expect and took all of his tips under consideration when chosing my techniques. Initially, I though I'd go with just normal brush strokes over a black undercoat, but I was a bit afraid so I went to my local hobby store and picked up an Army Painter "Angel Green" spray primer. To be perfectly honest, once I coated the model, I wasn't very happy about this particular hue of green but it was too late so I had to go with it. The first thing I did was a light drybrush of Catachan Green over the whole model. Then I put a Badab Black wash in the receses. After that dried, I started the highlighting with Camo Green and then another pass with Rotten Flesh. This was achieved by a very light drybrushing as well since I'm still not convinced about the consistency of my brush line highliting. The mud part was yet another experiment on my part. I managed to buy some cheap pigments and fixer for them at our local shop and the fun began. I started off with doing the tracks a traditional way - putting a Tin Bitz base down followed by a light drybrush of chainmail. Then it was off to the pigments. The first layer was done with the lighter mud color. I mixed it so it was really dense and applied it with an old brush (I wanted a lot of texture at this point). Once that was dry, I mixed a lighter blend of brown pigment and applied it with a sponge to the bottom half to simulate fresh mud. 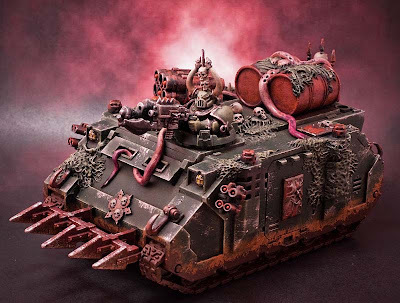 While doing it, I had a picture in my head of the GW tanks and how nicely done they look. I kind of wanted to copy that, but I think it would have required a much more fluid mix of pigment and fixer (sort of a pigment wash I guess). I'll have to try that next time. As it turned out, this effect is not so bad, it just represents a more "muddy" battlefield. The nurgle growth was pretty easy. I went with a Catachan Green layer over the green primer and then just highlighted with Camo Green and Rotten Flesh. The tentacles were a tougher nut. A started with a few layers of Dark Flesh. Then a layer of Dwarf Flesh followed by Elf Flesh. I applied an Ogryn flesh wash on top of that. Rotten Flesh/Bleached Bone highlights finished off the tentacles. The tips were done with Warlock Purple and a Leviathan Purple wash. A layer of gloss varnish on all the tentacles was the final touch to make them nice and slimy. The barrels were easy as well. A few layers of Dark Flesh followed by some Scab Red drybrush and faint Blood Red highlights. A Devlan Mud wash was applied and let dry. After that, I decided to apply a few pigments. I had both light and dark rust colors, so I liberally applied both in semi-equal proportions. I started this part off the same way as the barrels. However, this time I wanted some of the metal to show through so went ahead and sponged some chainmail randomly accross the whole thing adding more to the tips. I applied both the light mud and brown color pigments delicately to the bottom parts of the blade. I won't go into details of the marine since it was a pretty straightforward layering/blending/highligting job with the same trusted pallette. I do however want to share a pretty cool technique of painting skulls and horns that I use. I start off with Komando Khaki. Follow that with a heavy wash of Ogryn Flesh and then highlight with Bleached Bone. Turns out pretty cool in my opinion and is quite simple. It does require some patience with the application of Komando Khaki since it's tough to apply to black undercoat (requires many, many thin layers to look good). So there you have it, a decent looking rhino without an airbrush. It can be done. My intuition tells me that quite possibly, a lot of steps I took were redundant. I did gain a lot of experience doing it so it's not a waste. All said and done, I really want an airbrush though, mostly because of the control and repetition of the colors that it will allow. In conclusion, big thanks to Ron for his great article on brush painting vehicles. It gave me some solid info to think about and allowed me to make more informed decisions. I'd like to thank Piotr Michalek for sharing his pics with me. It's so cool to see someone who has used something I posted and turned it into something even more on their own models. If you want to see more of his work, you can check out his new blog here. Very nice work, Piotr, a great model overall! 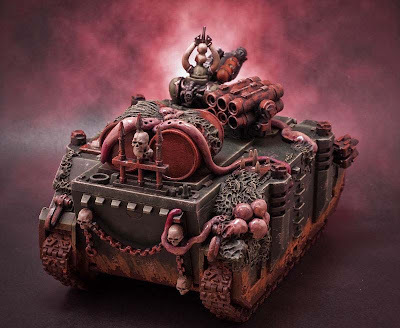 I also like that you didn't overdo the Nurgle-Conversion by putting Green Stuff all over the model (which often ruins Nurgle-conversion for me). Wow, very nice work indeed. For a first go at weathering, I think you've done a great job. thanks guys! now a predator is brewing :) might have it done by the end of the week! also, I did buy an airbrush lately so this time it will be done with that. Outstanding paint job and its set of beautifully in the Photos. As someone who has painted up a Death Guard army I am very impressed with your work. Great job. Your description states that you used green paints, but this rhino looks black and pink to my eye, with a dark green marine in the cupola. 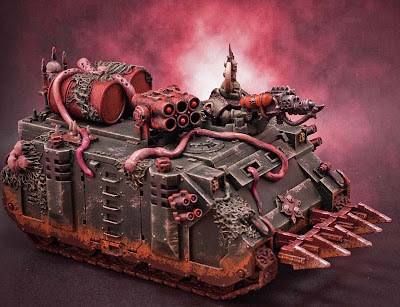 Your paint job and in particular the weathering is great but looks Slaanesh to me!